My Stuff Bags Foundation hasn't added a story. Once again my Usborne Books & More team and I are partnering with My Stuff Bags to fill duffel bags for children in crisis all over our country. My Stuff Bags is an amazing organization that works alongside many different child welfare agencies in every state. They provide duffel bags full of items for children who are placed into foster care emergently, often with nothing at all. It is their mission to provide these children with a piece of dignity and love. It is my deepest desire to utilize my resources as effectively as possible and to give back to our community and to our country the best way that I know how. It's often a dream of mine to help during crisis, and yet, I don't feel as if my small contribution can possibly help in a significant way. Through this book drive, I am able to partner with other women and donors like you, and together, we make a HUGE impact! To date our team has raised over $55,000 in books and bears (thanks to the generosity of Usborne and their commitment to match ALL donations by 50%)! Last year we were able to stuff 1,200 duffel bags for the youngest victims of Hurricane Harvey. That is something to be proud of! Your donation will allow us to purchase three books. The first is for the younger children; "Cuddle Bear" comes with a teddy bear plush. It is a book about unconditional love and comfort. The other two are for older children; "No Worries!" and "Be Happy!" are filled with age-appropriate drawing and writing exercises that help the children to define and understand their feelings, and discover paths to happiness, peace and positivity. They also help children cope with anxiety and stress, help to work out how and why they feel worried, encourage them to talk to others about their worries, and feel calmer. Activities such as these have been shown to have many positive benefits during trauma. No donation is too small. Usborne will match it! I believe that you and I TOGETHER can continue to do great things! My Stuff Bags Foundation hasn't posted any updates yet. 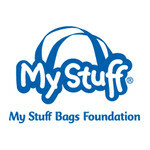 My Stuff Bags Foundation is managing the funds for this campaign.